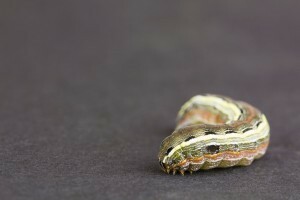 Armyworms appear throughout the summer months and can damage most any southern turfgrass. Though they prefer St. Augustine, bermuda, ryegrass and bluegrass, they’ll readily attack most any fescue or bent grass turf when foraging. They also eat plants, flowers and basically anything green and low lying in the yard. 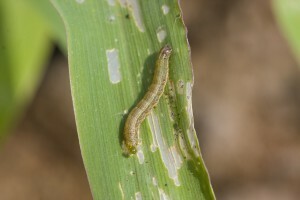 Distributed throughout the United States and found in most any state, armyworms release 2-3 waves of larvae per season. Starting in the south, larvae feed, pupate and emerge as a moth that tends to fly north where it will mate, lay eggs and start the cycle all over again. Females can lay hundreds of eggs so a yard can go from none to a lot seemingly overnight. When conditions are right, there can be huge migrations of this pest across the southeast and up toward the Canadian border. Armyworms damage grass and other plants by eating it’s crown or grass blades. They’ll create or weave webs across your turf in small areas which are easiest to see if viewed in early morning when the dew is still wet. During the day the larvae will hide amongst the thatch or in self made tunnels just below the soils surface. Anyone that leaves grass clippings to mulch back as fertilizer is creating a haven for many insects including armyworms. They love this environment. If you’ve been leaving your clippings or if you note a lot of loose thatch throughout your yard, get it cleaned up. This will help by both eliminating their nest sites and allowing treatments to work better after being applied. Though it’s common to see small damaged areas, armyworms will scatter throughout your turf so it’s important to treat the whole yard. Many times the damage they cause will denude or brown patches in the grass. This damage can be misdiagnosed as a fungus since the end result is similar looking. But if you’re seeing the adult moths or young caterpillars, get treating to reduce long term damage. The strongest armyworm control option includes a combination of DELTAGARD GRANULES and CYONARA. First apply 2-3 lbs of Deltagard per 1,000 sq/ft of turf. Renew once a month throughout the summer and fall. Next, spray over the top with Cyonara. 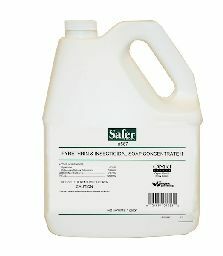 For most problems, using 1 oz in 5 gallons of water per 5,000 sq/ft will do the job. Expect to treat twice to solve established problems; space the treatments two weeks apart. Once under control, spray once a month to make sure they don’t return. You’ll need a lot of water to cover most any yard so a good HOSE END SPRAYER is usually the best way to make the application. 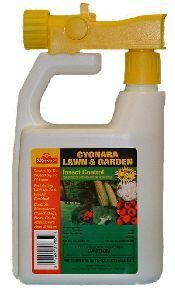 When using our sprayer, you’ll want to add 1 oz of the Cyonara to the sprayer and then fill it up with water to the 5 gallon line. Next, you’ll need to hook it to your garden hose and apply the entire contents over 5,000 sq/ft. This sprayer can hold up to 4 oz and be filled to the top which will create enough material for use over 20,000 sq/ft (20 gallons worth). 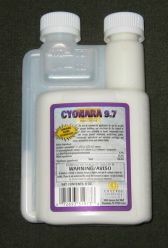 If you have a small yard (5,000 sq/ft or less), CYONARA RTS might be enough to do the job. With this container, you only need to hook it to your hose and spray. The container has enough concentrate inside to treat up to 15,000 sq/ft. If you prefer to use something organic, MULTIPURPOSE INSECT KILLER is approved for organic gardening and is safe enough to spray on any lawn or garden plant. It will cost more to use this option but its just as effective compared to the longer lasting traditional products. 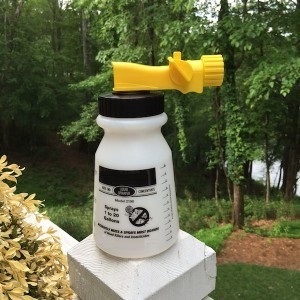 You’ll need 6 oz of this concentrate per 700 sq/ft of turf so when using the hose end sprayer above, fill it half way with the concentrate and then the rest of the way with water. Use the entire contents to cover up to 2,000 sq/ft of turf. Using this rate, the quart of concentrate will be enough to cover around 3500 sq/ft; the gallon jug will cover up to 14,4oo sq/ft. Expect to do at least 2 treatments to solve a problem spaced 2 weeks apart; once a month applications to keep them away. For the past two years I have had a horrible time trying to get rid army worms out of my River Birch Trees. They have also attacked a small oak tree. I have not noticed them in my grass. I have used different pesticides, but none seem to work. Please help me!!! Army worms can be tough to control unless you use one of our professional grade products like the ones listed above. Additionally, even though you may not see them active in the grass, this is a vital area that must be treated because if you ignore it, they’ll be back year after year. So for your Birches, you’ll first need to apply the Bifen Granules around the tree in the mulch and grass. Next, you’ll need to spray Cyonara RTS on as much of the tree as you can reach as well as the ground. Doing several treatments this year should take care of the immediate problem and the granules applied to the turf will take care of the young that are no doubt developing out of sight. Failure to treat both locations will result in them coming back season after season. We need enough of your product to spray 155 acres. Where can I buy it? Do you ship? If you review the label of the Cyonara, you’ll learn it will take about 5 oz of concentrate per acre. And yes, we do ship. Order on line following the link below and since we ship within one business day, you should have the product within a few days.